For 4th century author, see Lactantius Placidus. Lactantius, a Latin-speaking North African of Berber origin, was not born into a Christian family. He was a pupil of Arnobius who taught at Sicca Veneria, an important town in Numidia. In his early life, he taught rhetoric in his native town, which may have been Cirta in Numidia, where an inscription mentions a certain "L. Caecilius Firmianus". As a Latin rhetor in a Greek city, he subsequently lived in poverty according to Saint Jerome and eked out a living by writing until Constantine I became his patron. The persecution forced him to leave Nicomedia and from the outbreak of hostilities until perhaps 311 or 313 he had to live elsewhere. The Emperor Constantine appointed the elderly Lactantius Latin tutor to his son Crispus. Lactantius followed Crispus to Trier in 317, when Crispus was made Caesar (lesser co-emperor) and sent to the city. Crispus was put to death in 326, but when Lactantius died and under what circumstances are unknown. 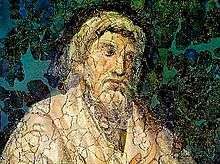 Like many writers in the first few centuries of the early church, Lactantius took a premillennialist view, holding that the second coming of Christ will precede a millennium or a thousand-year reign of Christ on earth. According to Charles E. Hill, "With Lactantius in the early fourth century we see a determined attempt to revive a more “genuine” form of chiliasm." Lactantius quoted the Sibyls extensively. Book VII of The Divine Institutes indicates a familiarity with Jewish, Christian, Egyptian and Iranian apocalyptic material. De Mortibus Persecutorum ("On the Deaths of the Persecutors") has an apologetic character but has been treated as a work of history by Christian writers. The point of the work is to describe the deaths of the persecutors of Christians before Lactanius (Nero, Domitian, Decius, Valerian, Aurelian) and the contemporaries of Lactantius himself: Diocletian, Maximian, Galerius, Maximinus. This work is taken as a chronicle of the last and greatest of the persecutions in spite of the moral point that each anecdote has been arranged to tell. Here, Lactantius preserves the story of Constantine's vision of the Chi Rho before his conversion to Christianity. 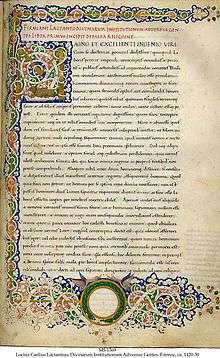 The full text is found in only one manuscript, which bears the title Lucii Caecilii liber ad Donatum Confessorem de Mortibus Persecutorum. ↑ His role is examined in detail in Elizabeth DePalma Digeser, The Making of a Christian Empire: Lactantius and Rome, 2000. ↑ Serralda, Vincent; Huard, André (1984). Le Berbère-- lumière de l'Occident (in French). Nouvelles Editions Latines. p. 56. ISBN 9782723302395. ↑ Annales de la Société d'histoire et d'archéologie de l'arrondissement de Saint-Malo (in French). 1957. p. 83. ↑ Manceron, Gilles; Aïssani, Farid (1996). Algérie: comprendre la crise (in French). Editions Complexe. p. 161. ISBN 9782870276617. ↑ Dérives (in French). 1985. p. 15. ↑ Conte, Gian Biagio (1999). Latin Literature: A History. Baltimore: JHU Press. p. 640. ISBN 0-8018-6253-1. Retrieved August 29, 2016. ↑ Paul Stephenson, Constantine, Roman Emperor, Christian Victor, 2010:104. ↑ Encyclopædia Britannica. 7 (15th ed.). 1993. 1 2 3 W. Fletcher (1871). The Works of Lactantius. ↑ "Lot 65 Sale 6417 LACTANTIUS, Lucius Coelius Firmianus (c. 240–c. 320). Opera.". Retrieved 2010-12-29. ↑ Froom 1950, pp. 357-358. ↑ Froom 1950, pp. 358. ↑ Froom 1950, pp. 356-357. ↑ "The Rubrics of the First Book of Lactantius Firmianus's On the Divine Institutes Against the Pagans Begin". World Digital Library. 2011-10-17. Retrieved 2014-03-01. ↑ Polonsky Foundation Digitization Project: full scan of Lucius Coelius Firmianus Lactantius, Opera hosted by the Bodleian Libraries (bodleian.ox.ac.uk) Provenance information: http://incunables.bodleian.ox.ac.uk/record/L-002 Accessed 13 July 2015. This article incorporates text from a publication now in the public domain: Herbermann, Charles, ed. (1913). "Lucius Caecilius Firmianus Lactantius". Catholic Encyclopedia. New York: Robert Appleton.